This basil corn recipe was originally introduced to me by my friends while we were staying at their cottage a few summers ago. 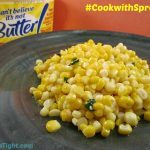 When I partnered with Unilever brands on this sponsored campaign, I just knew I had to share this corn recipe that is best when made with I Can’t Believe It’s Not Butter. During my last Walmart shopping trip I grabbed the ingredients. As promised, I will now share the recipe with you. Sponsored post. 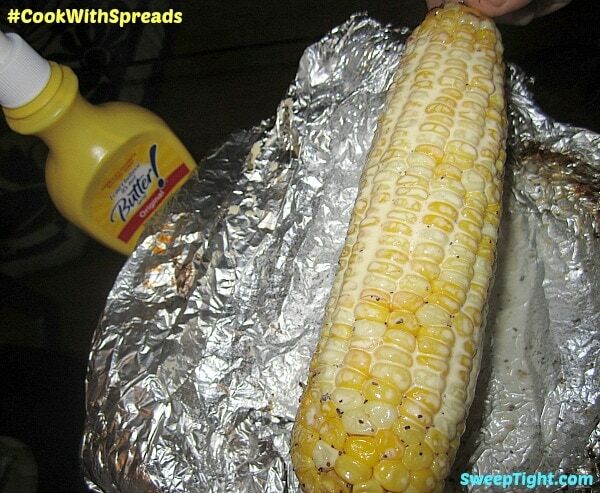 We just love corn on the cob from the grill. We eat it almost everyday during the summer and spray it with I Can’t Believe It’s Not Butter Spray for delicious flavor. As you can see in this pic, Mike does not hold back with the spray. To change things up a bit, I like to take the corn off the cob to make an awesome basil corn recipe. 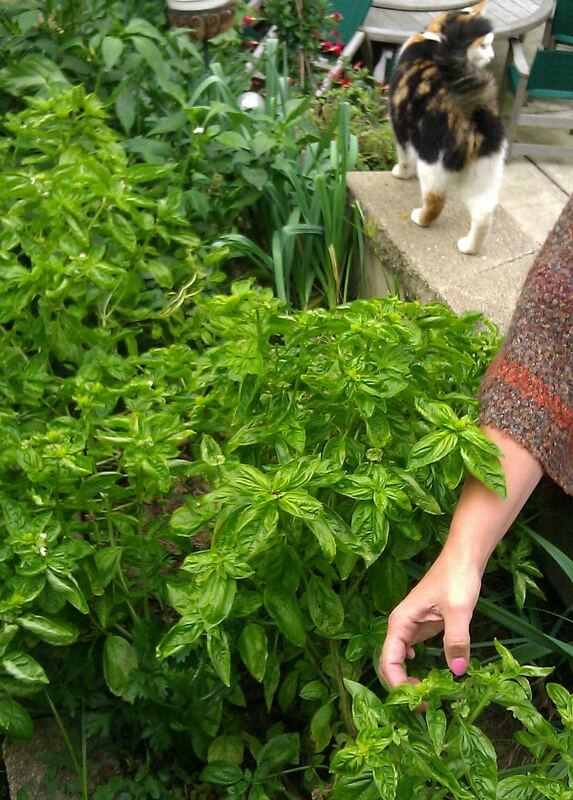 It’s so easy and perfect for people who grow fresh basil in their gardens. Purchasing fresh corn on the cob in their husks is ideal. Grilling them in their husks usually makes it easy to remove the corn silk-free. If you choose not to grill, there’s an easy way to do this right in your kitchen. Soak corn cobs in their husks in room temperature water for 20 minutes. Remove and drain. Microwave corn in husks for five minutes. Cut the bottom of the corn off. Squeeze from the top and the cob should fall easily right out of the husk. After doing those steps, it’s also very easy to cut the corn right off of the cob. Then, all you need is some basil (ideally fresh), I Can’t Believe It’s Not Butter spread, a little salt & pepper and you are good to go. Using the I Can’t Believe It’s Not Butter spread here is ideal. Not only does it have 70% less saturated fat than butter and 30% fewer calories, but it also adds great flavor to this medley. There’s something about the mix of these ingredients that is just super tasty. Make sure to check out other recipes featuring tasty spreads instead of butter. Use up some of that fresh basil from the garden to add delicious flavor to corn. 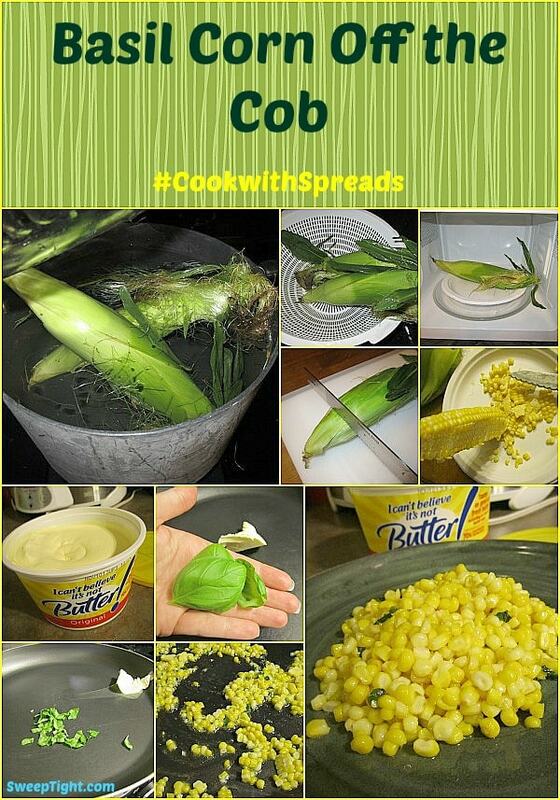 Remove corn from cob however you choose. 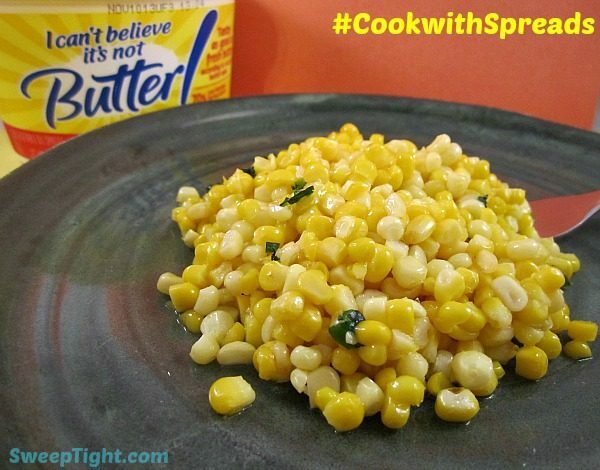 Add about a tablespoon of I Can't Believe it's Not Butter spread to a saute pan and heat. Tear or cut up approximately 4-5 basil leaves and add to pan. Adjust these ingredients to your taste. I love the taste of basil, so I like to add a lot of it (more than pictured above). Mike prefers his super “buttery”, so I add a lot more I Can’t Believe It’s Not Butter spread to his portion. He can also just use the spray at that point. Depending on your tastes, you can switch it up however you like. But, there’s something about corn and basil that is summery and scrumptious! The Tortilla-Crusted Chicken Breasts look amazing!! YUMMY! O grams of trans fats, gluten free and no cholesterol , less fat than butter and fewer calories with than butter. I use I Can Not Believe its not butter on so many items. It tastes delicious! This sounds awesome. I’ll have to try it. I use I Can’t Believe it’s not Butter a lot and we love it in our house. the Cinnamon-Walnut Power Bars recipe looks good! The Roasted Cod with bell peppers looks tasty. The tortilla-crusted chicken breasts look good. The Honey-Nut Glazed Brie looks so delicious! The Greek Garlic-Oregano Roasted Chicken Dinner looks yummy. Chili Parmesan Popcorn & Peanuts look yummy! I want to try the recipe for Baked Chicken Fingers. The loaded broccoli mashed potatoes! I like their coffee infused cupcakes with frosting recipe! Yum! Roasted Cod with Bell Peppers! The Chicken Sandwiches with Basil Aioli looks really good to me. The Tortilla-Crusted Chicken Breasts looks the best to me. The Chili Parmesan Popcorn and Peanuts recipe looks awesome! I would love to make the Sweet Potato Pie! I would like to use I Can Not Believe its not Butter in it! Even though it’s not seasonal right now, the Apple Maple Upside-Down Cake looks good to me. I’ll be making it later in the summer, though! The Rosemary-Orange Chicken & Veggies look delicious. I like the Honey-Roasted Sweet Potatoes – thank you. The sauteed vegetables look great! The Chili Parmesan Popcorn & Peanuts looks good. I think the Cinnamon-Walnut Power Bars look great. The Tortilla-Crusted Chicken Breasts looks good! I want to try the Easiest Ever French Toast. Lots of those recipes look good. I think the Parmesan-Crusted Sweet Potato Fries would be a hit in this house. I like the roasted cod with bell peppers. Mmm coffee infused chocolate cupcakes! The Grilled Chicken Sandwiches With Basil Aioli. Snappy Chicken Wings look good. Tortilla-Crusted Chicken Breasts, look good to me. Oh the Herbed Garlic Bread recipe with the country crock looks really good to me! Those tortilla crusted chicken breasts look tasty! The Grilled Chicken Sandwiches With Basil Aioli looks yummy! I think the spicy oven fries look yummy! Grilled Chicken Sandwiches With Basil Aioli looks the best. Parmesan-Crusted Sweet Potato Fries look amazing! The country crock spread looks great!! The Tortilla-Crusted Chicken Breasts looks tasty! The Classic Macaroni & Cheese looks the best to me – ultimate comfort food. The “Grilled Chicken Sandwiches With Basil Aioli” looks best to me. Brummel and brown has less sat fat and no trans fat. Love the recipes! The Grilled Chicken Sandwich With Basil Aioli looks best to me. I like the Dutch Baby Pancakes. The dutch baby pancakes look the best to me. I would love to try them. The Grilled Chicken Sandwiches look good. Brummel and Brown has the fewest amount of calories. Would like to try. The Stuffed Chicken with Goat Cheese looks good to me! The Apple Maple Upside-Down Cake looks really good! Cinnamon walnut power bars look great! Thank you! The Sauteed Vegetables look so good. Roasted Turkey With Buttery Sage Rub..wow that looks so yummy. I want that now!!! Looking through the recipe section the Loaded Broccoli Mashed Potatoes recipe looks good with buttery spread. I’d love to make the Buttery Cilantro Steak. The Tortilla-Crusted Chicken Breast looks awesome. I’d like to try the tortilla-crusted chicken breasts (except I’d use thighs). Apple Maple Upside-Down Cake looks good! The Chili Parmesan Popcorn & Peanuts looks good! I’d love to try the Easiest Ever French Toast. THE sauteed vegetables look yummy! Tortilla-Crusted Chicken Breasts look tasty! Darn! And here I thought I invented this savory summer recipe! Fresh corn and basil are a natural (we discovered when I tried serving a Caprese Salad on top of freshly made polenta blended with plenty of fresh corn off the cob and it was SOOO good! And I have a sneaking suspicion that while not quite as grand as your Fresh Corn & Basil dish – that quality frozen corn cooked (steam-nuked) properly would taste pretty darn good – if not nearly as PRETTY to look at. I use I Can’t Believe It’s Not Butter all the time. My favorite is on my baked poatoes & m cheese grits!